With the biggest eating holiday of the year upon us, today seemed like a good day to write-up our dining experience on the Norwegian Bliss! Before we get there, however, I’ll point out that I’m only covering the specialty restaurants we chose to eat at, not any of the free options. We did eat at The Local, Taste, Savor and even the Manhattan Room one night, which were fine, but the specialties are what really stand out with the Norwegian Freestyle experience. The topic of specialty restaurants sometimes sparks some lively discussion regarding the perception of nickel-and-diming by the various lines, and I have no illusion that some will be turned off by me only covering those here. As ships have gotten bigger, the number of specialty restaurants on board has grown too, giving the lines additional revenue opportunities. In the past we rarely ate at specialty restaurants, save for the occasional steakhouse on a special occasion, but those were few and far between. 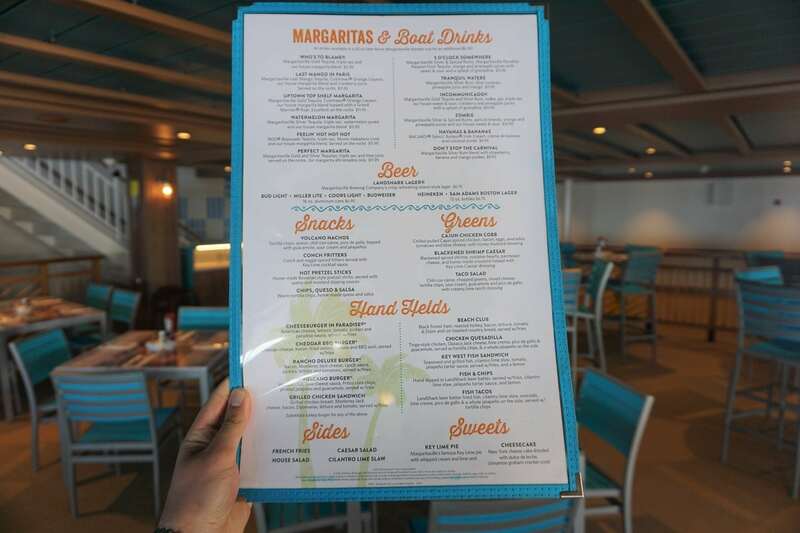 That all changed on our Norwegian Escape sailing three years ago when we decided to give some of the restaurants on that ship a shot, and we were not disappointed! With another sailing on Norwegian, purchasing a dining package was a no brainer for us. If you’re looking for ideas of places to try on the Bliss, read on! This is one of the three places we chose to use our dining package on, and frankly I wasn’t sure what to expect since the reviews all seem rather mixed. After we were seated, the waitress came by and explained how things worked with the dining package, and I have to say, I was unprepared for what this would mean to my stomach. 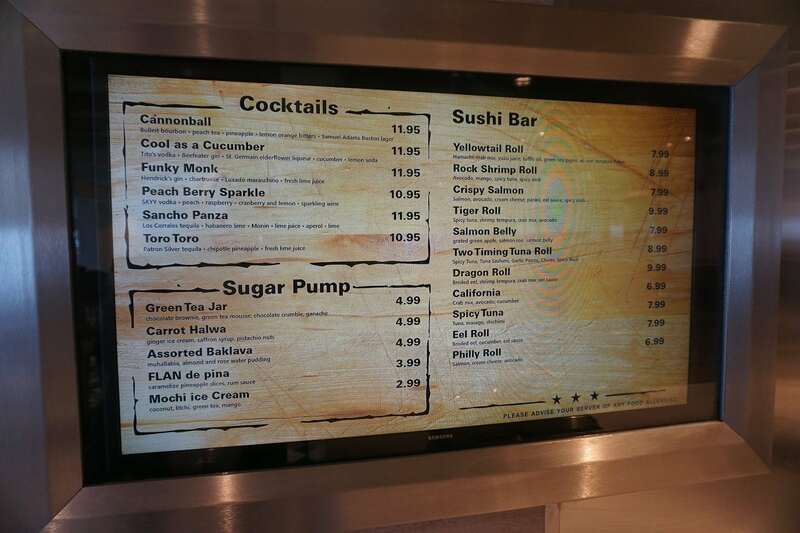 Before we get in to this, take a look at the menu located here. You get as many appetizers as you want, an entrée with as many sides as you want, along with a dessert. 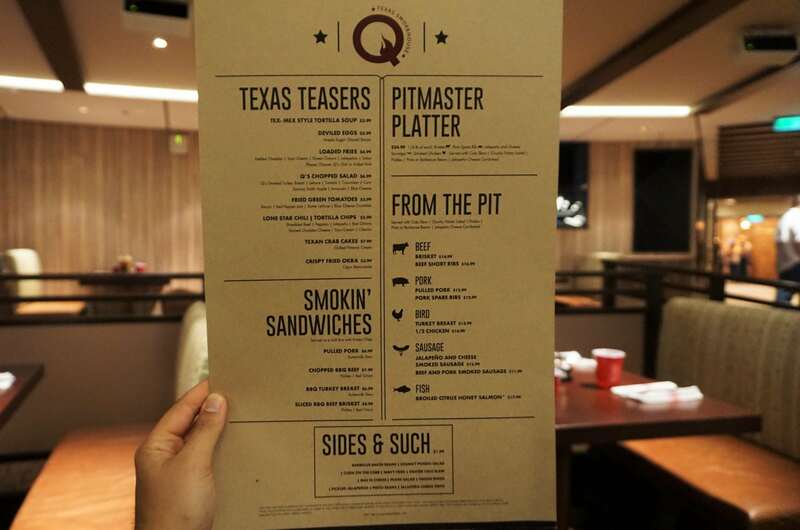 If you looked at the menu, keep in mind that you can get the Pitmaster Platter as your entree too! As shown in the pics below, I started with the Deviled Eggs and Loaded Chips. For my entrée, the Beef and Pork Sausage Platter with corn on the cob and mac & cheese as my sides. Everything was delicious, especially the deviled eggs and sausage. By this point we were both stuffed, but knowing we still had a dessert menu to look at, we soldiered on. The decision really wasn’t that hard. Jen went with the Mason Jar Bread Pudding, and I chose the Bread Pudding w/Whiskey Sauce. Yowza they were good. This proved to be an excellent start to our dining experience on the Bliss! Night two brought us to the one place I was a bit apprehensive about, Le Bistro. I say that because I don’t really get too adventurous with food. I know what I like and I tend to stick to it, and knowing this was a French venue had me concerned that I’d have a hard time finding something I liked. Boy was I wrong! We used the dining package for this one as well, and as before, the waitress said that we could choose more than one appetizer if we wanted to (menu for reference). I chose to only have one due to my aforementioned pickiness when it comes to eating. Frankly, I didn’t see anything in the list I really wanted, but chose to try the Gratiné A L’oignon (Onion Soup), and I was glad I did. I’m not a big soup fan and I don’t like onions, which should have been the death knoll of this choice, but it was outstanding! Following my delicious soup, it was entrée time! This was a bit easier, as I’m all about some filet mignon, so I went with the Filet de boeuf grillé. Again, excellent! Easily the best filet I’ve had on any ship we’ve sailed, and it was cooked to a perfect medium rare as ordered. Once we finished the entrées, it was time to choose our dessert. Jen chose the Chocolate Fondue for Two, and I went with the Profiteroles. Both were excellent, but I learned I need more profiteroles in my life. Those things were soooo good. This restaurant is situated in a quiet nook on deck 16, and isn’t really a place you wear shorts and t-shirts to. If you’re looking for a nice quiet, romantic meal aboard the Bliss, this is where you want to go! I should also mention that the service in Le Bistro was some of the best we’ve experienced at any restaurant, land or sea. This is near the top of my all-time favorite shipboard eateries! Night 3 brought us to one of the venues we’d been looking forward to since we booked this cruise, Teppanyaki, which was also the last restaurant on our dining package. As mentioned in the Escape post, this was one of the best Japanese steakhouses we’ve ever eaten at, so we were hoping the Bliss version of it would live up to that. Spoiler alert: It did! That garlic fried rice is some of the best out there, and once again, my filet mignon was cooked perfectly. As the chef doles out certain items like rice, he cooks extra in case anyone wants seconds. Jen and I took him up on that for rice, and somehow I got a lot of extra filet. A couple of minutes after serving me my helping of steak, he sent another round my way. What you see in the picture below is only the first helping. I had almost double that shortly after the picture was taken! Excellent food, excellent service, and a great show from the chef left us happy with our choice once again. Teppanyaki is definitely a favorite of ours and one I highly recommend trying if you sail a Norwegian ship that has it! 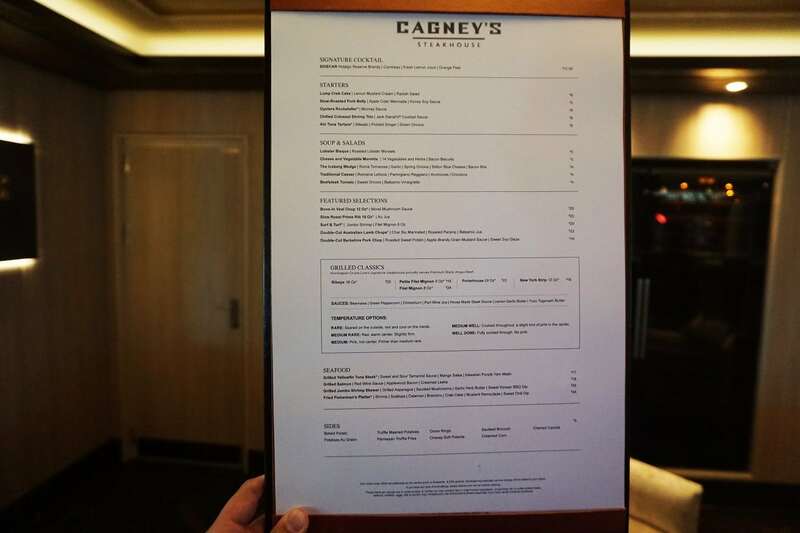 On the 4th night of our sailing, we were invited to Cagney’s as part of an industry-related meeting, so we were on someone else’s tab for this one :). We’d eaten here on the Escape and enjoyed it, but hadn’t planned to eat here until we got the invite. This is an easy one for me to find food I like, as I’m very much a meat and potatoes kinda guy. Starting off, I went with the Pork Belly appetizer and Iceberg Wedge salad (menu for reference). Both were tasty, but those pork belly squares are a home run! For my appetizer, surprise, another filet! While it was cooked medium rare as ordered and tasty, the filets at Le Bistro and Teppanyaki were definitely better. This just seemed a little dry to me, so it was nice to have the chimichurry sauce to go with it. The desserts here were pretty good, with my chocolate cake being really, really rich. One of the other people at our table got the warm brownie dessert, and I think we all wished we’d have gotten it after sampling it, super tasty! After we sailed on the Escape, this was just below Teppanyaki as one of my all-time favorite restaurants on a ship, so I was very much looking forward to eating here on the Bliss. This one’s not part of the dining packages, it’s an a-la-cart fusion restaurant that combines various cooking styles and culinary traditions set in a venue that offers plentiful sea views. On the Escape, I really enjoyed the Wagyu bone-in rib-eye, and I was a little disappointed when I saw that wasn’t on the menu anymore, but my disappointment subsided as we started ordering. 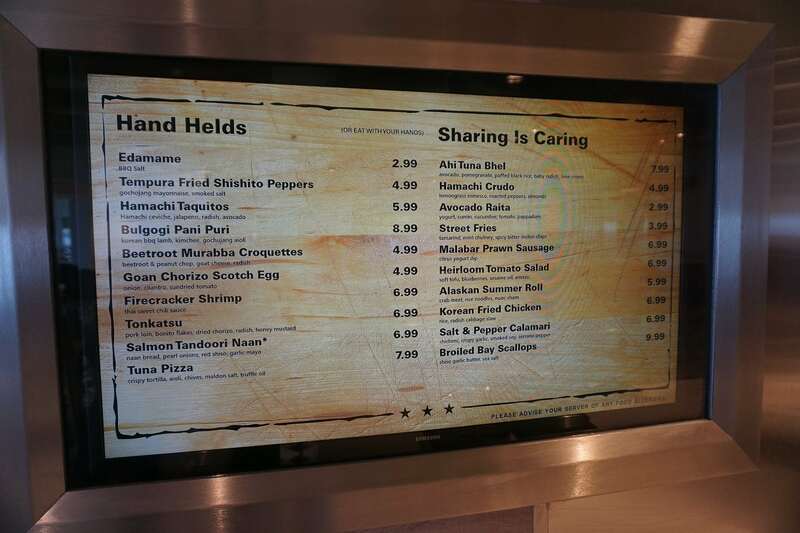 Here’s where I remind you that it’s a-la-cart, and the bill can add up pretty quickly as you start ordering things for yourself and things to share. 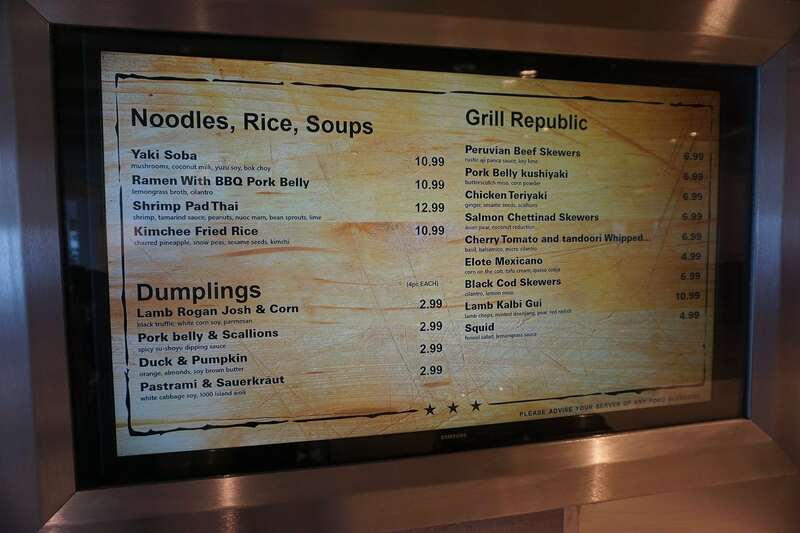 I should also link to menus for this place (these are not my menu shots, sy the way): Handhelds/Sharables, Rice/Noodles/Grill, Drinks/Desserts. We did order more than we really needed, but it was really tasty and I’m pretty sure we finished everything. From the Korean Fried Chicken to the Peruvian Beef Skewers, Chicken Teriaki, Kimchi Fried Rice, ending with the Baklava, everything was delicious. To me, this is a must-visit on Norwegian ships that have it! We’d originally intended on using one of our three dining credits here, but got a last-minute industry invite, so this ended up being another one we didn’t have to pay for. Huge thank you to our hostess for the invite, we had a great time here! 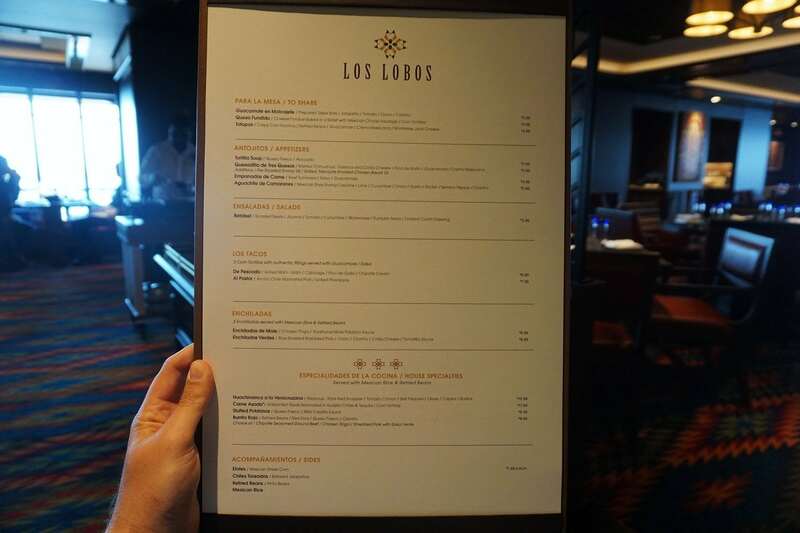 Los Lobos sits at the back of the ship next to Cagney’s, and is considered upscale Mexican. Jen’s a taco lover, and I’m always up for a good burrito, and Los Lobos didn’t disappoint. I started things with one of their signature drinks, the Luna Margarita, which was excellent! The Burrito Rojo (which I ordered with ground beef) was quite delicious as well, as was the queso we had to dip our chips in to start things off. Unfortunately, all I have pictures of here are the margarita and burrito, as we were focused on the food and discussions around the table, and I forgot to snap the room or appetizers. Oh well, next time! 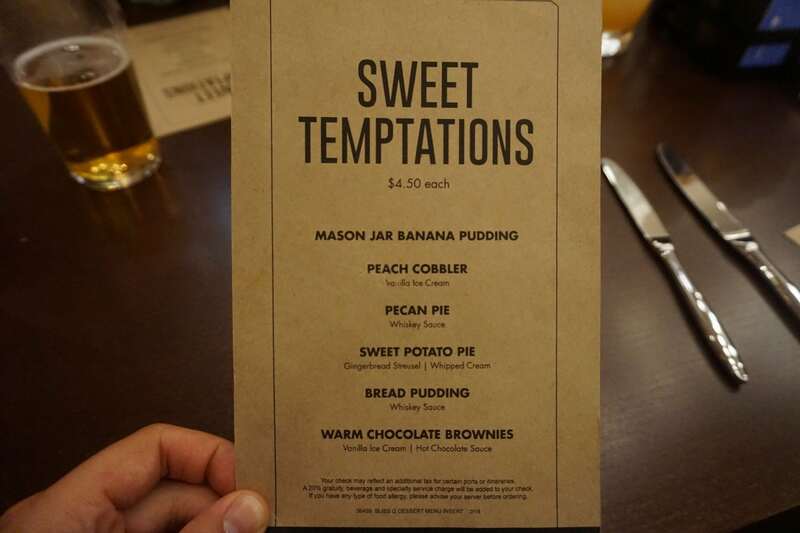 Here’s the menu for reference too. If you’re in the mood for Mexican food, give Los Lobos a try! The final stop on our specialty dining tour was at Margaritaville. When we sailed the Escape in 2015, there was no additional charge for this venue, but that led to huge waits for seating, as mentioned in my past post. Shortly after that sailing, they instituted a small charge (compared to the cost of the other specialties) to eat here, $14.95/pp + 20% gratuity. We never noticed a wait or full seating here, so I’m not sure if the charge has taken things too far in the opposite direction, but we decided to eat here for lunch the day we were in Ensenada. I tend to stick with the staples when we eat at Margaritaville, and this visit was no different, a Cheeseburger in Paradise followed by that signature Key Lime Pie for dessert (menu for reference). I also went with a watermelon margarita to drink, and while it was good, seemed a bit small for the price. I’ll also mention that this was the only venue we had service issues in. There were very few patrons in there while we ate, but our server still seemed overwhelmed, and things like refills proved fairly elusive. At one point we had to track down another server to get additional drinks, and later our bill. Questionable service aside, the food itself lived up to the Margaritaville name. I could really go for another slice of that key lime pie right about now! That brings us to the end of our Norwegian Bliss specialty restaurant tour. With all of the paid restaurants we visited, we only ended up in the MDR one night, and while it was fine, I’d have been happy to visit any of the above venues again instead. Whatever your opinion of the specialty dining craze, I recommend giving any of these a try if you’re sailing a Norwegian ship that has them! Credit to EatSleepCruise and CruiseCritic for the menu pictures I’ve been linking to.